Alia and Julia both went to Vassar and played on the volleyball team with me, so you may recognize them from last year's Vassar Volleyball Reunion. 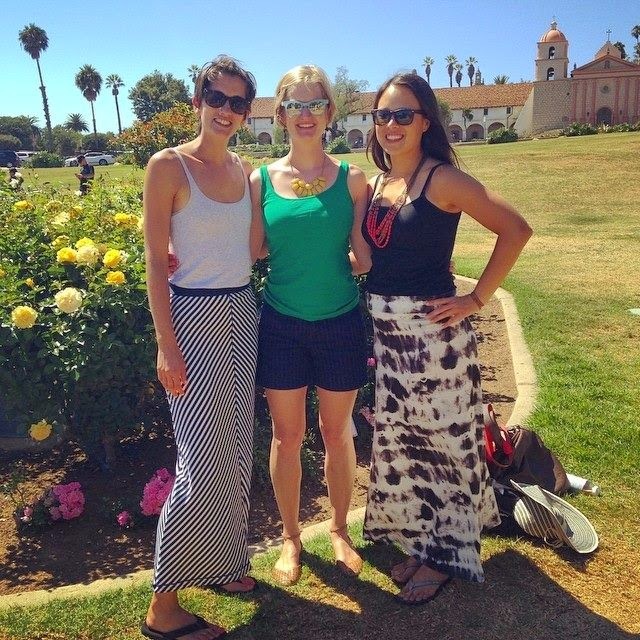 They both live on the East coast and it was both of their first time'[s in Santa Barbara, so I was excited to show them a good time. 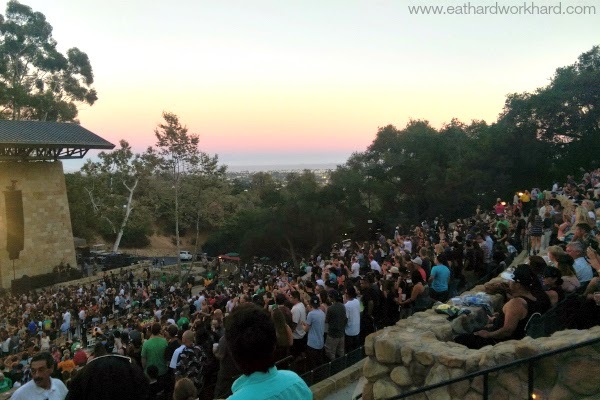 On Friday night we went to the Rebelution concert at the Santa Barbara Bowl. It was my first concert at the Bowl, which is a gorgeous open air venue with a view of the sunset over the ocean. Confession: I'm not the biggest reggae fan and never heard any of Rebelution's music until I started studying up on Spotify the day before the concert. But I LOVED the show! They have a great trumpet and incredible saxophone player, which is totally not something I associate with reggae. Good music plus a fun vibe and some pretty amazing people watching made for an awesome night. 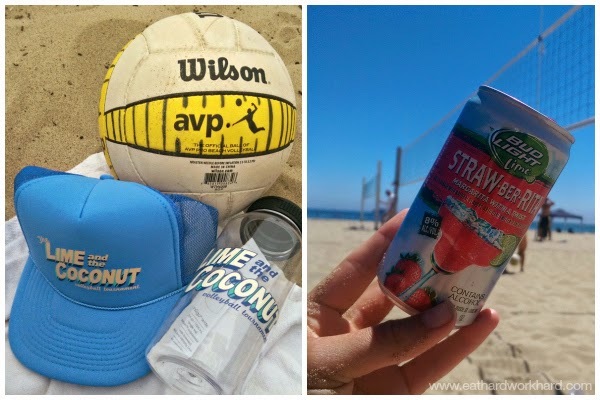 On Saturday, my friends hung out at the beach with me all day while I played in the annual The Lime and The Coconut Beach Volleyball Tournament. The Lime and The Coconut is a cool coed doubles tournament where you register individually and play with multiple partners during pool play. The top two men and women with the best records in pool play then get matched up with a random partner for a single elimination playoff bracket. I actually won my games with all four partners and went undefeated in my pool. Then, after waiting around about an hour for playoffs and playing a few more pick up games for fun, I immediately lost in the first round. Oh well, at least there was plenty of free beer to help me drown my sorrows rehydrate. 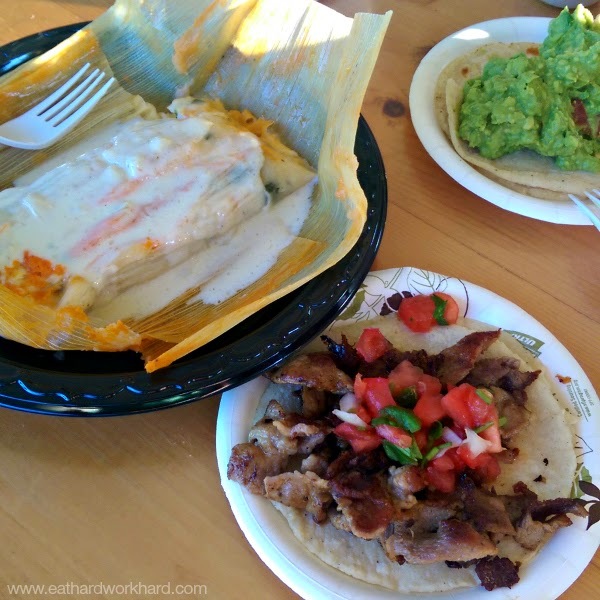 After the beach, we had the BEST post-tournament "snack" ever: cheap and delicious tacos and tamales from the famous hole-in-the-wall Mexican restaurant, La Super Rica Taqueria. Next, we cleaned ourselves up and took a short rest before a super-fancy dinner at Julienne and a fun girls night out on the town. 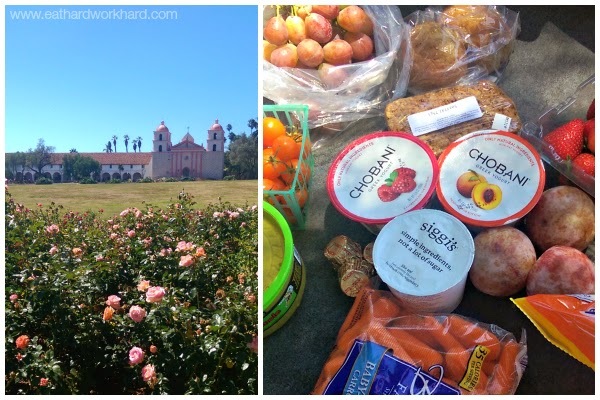 On Sunday, we recovered from all of Saturday's rich food and fun with a delicious light picnic brunch at the Santa Barbara Mission Rose Garden. And then went right back to eating rich food at THE BEST grilled cheese night ever. Our Vassar classmate Greg is in grad school in Santa Barbara, is an awesome party host, and basically a gourmet chef. At my subtle "hey you should probably have a dinner party when Alia and Julia are in town" suggestion, Greg agreed to host a build-your-own grilled cheese party with fancy ingredients. We're talking sage browned butter, triple creme brie, maple blueberry bacon, and caramelized pears. Oh and did I mentioned that Greg CONFIT-ED A DUCK! There was duck confit grilled cheese! 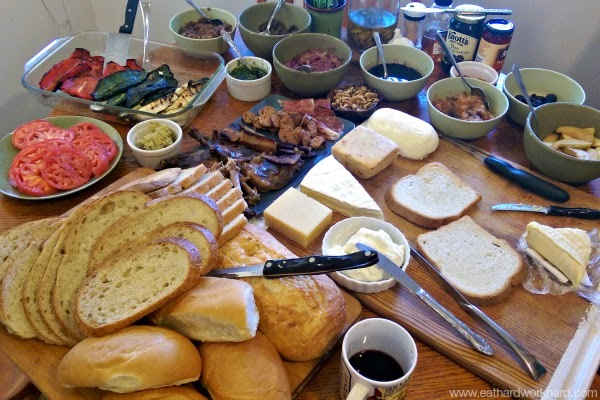 Everyone took turns coming up with their most inventive flavor combinations, grilling it up on the panini press, and cutting it into bite-sized pieces for everyone to try. My favorite combination was fig, honey, walnuts, balsamic vinegar and goat cheese on sourdough. My most successful sandwich was chimichurri sauce, roasted red pepper, chorizo, jalapeno jack, and stilton on cheddar ciabatta. It was pretty much my favorite dinner party ever. 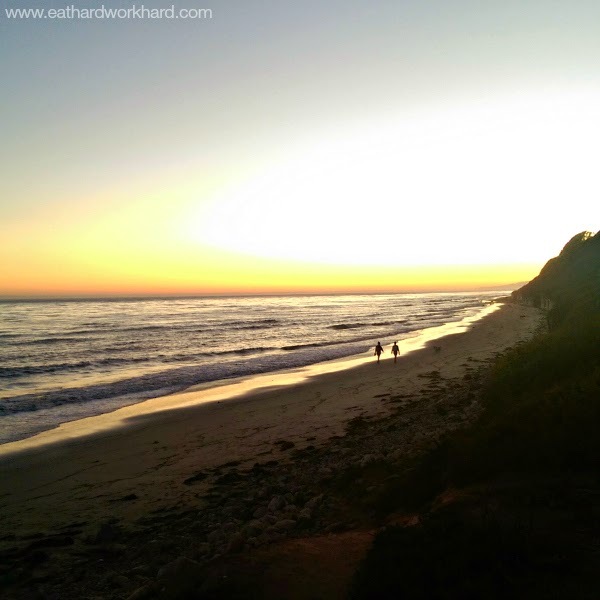 After dinner, a walk to the beach to watch the sunset was the perfect end to a perfect weekend. Now back to trying to do a little more working hard and a little less eating hard. Q: How was your weekend? What's the best thing you've ever put on a grilled cheese? Wow, sounds like a great weekend and I am super jealous of that grilled cheese spread! It looks amazing. My favorite grilled cheese currently is apple, sharp cheddar and a spicy mustard. Wish I had friends on the west coast to show me a great time..haha. Chaitali's grilled cheese sounds yummy. I sometimes put spinach dip on my grilled cheese. That's tasty too! Sounds like you had a fun fun weekend! Congrats on the v-ball wins. I think your friend Greg started a trend, I definitely want to host a fancy grilled cheese party now haha. The Mexican food looked delicious too. Thanks Jenny! You should totally host one! Greg also does a similar make-your-own grilled pizza party. Haven't been yet but I'm going to try hard to invite myself to one soon lol.